International Airlines Group is launching LEVEL – a new low cost long-haul airline brand. The carrier will take to the skies in June, with flights from Barcelona to Los Angeles, San Francisco (Oakland), Buenos Aires and Punta Cana. 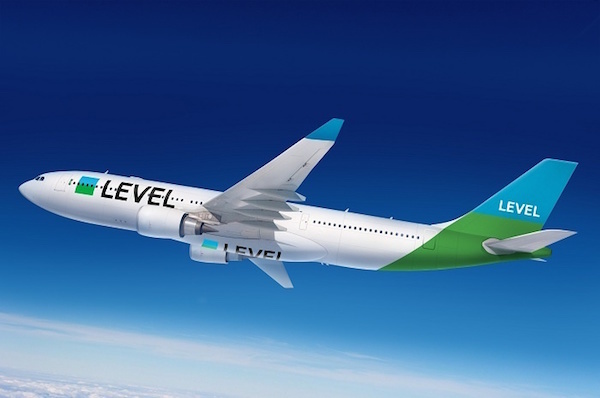 LEVEL will fly two new Airbus A330 aircraft branded in its own livery and fitted with 293 economy and 21 premium economy seats. Initially it will be operated by Iberia’s flight and cabin crew and will create up to 250 jobs based in Barcelona. Barcelona has been chosen as the first European city for the launch of IAG’s new operation but LEVEL will look to expand its flights from other European cities. Checked luggage (in addition to a free cabin bag), meals, seat selection and the latest movie releases will be complimentary for customers flying in premium economy. Those travelling in economy can chose what they want to buy based on a menu of choices. All customers will have access to next generation inflight technology with a wide range of on-board entertainment options. High speed internet connectivity will also be available. LEVEL’s customers will be able to earn and redeem Avios – the loyalty currency for IAG’s airlines. This will give them the opportunity to fly to 380 destinations across the group’s network.